It's nice to see a different colour. All the Dalek stuff seems to focus on the red one. 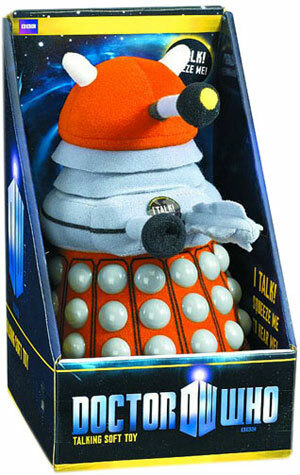 I want a yellow Dalek plushie. Got to say I agree with this - red is my favourite colour but it's nice to have some variety. Now if we could just have some other things made plushie ... a Doctor maybe. YES! Totally need a plush Doctor! I need that TARDIS plushie. Can't wait to see the Doctors! I don't think they will do Doctor plushies because of how costly it can be. It may work differently in different circumstances but I remember a big thing about Giselle from Enchanted not being added to the Disney Princess line because they would have to pay Amy Adams royalties for life for using her likeness which would cost a lot of money. I would assume, though I might be wrong, that it would be similar for the use of the likeness of Tennant or Smith etc. I like the white one. Wonder if they will release an orange one. That's the most underrepresented of the lot. The white one is definately best. Too many red Daleks on everything. And ... answering my wishes ... The Eleventh Doctor!!! They are due out at the end of August apparently (although this is already a revised date as they were originally slated for July).